President Yameen’s vision for urban development encompasses the broad philosophies of national, economic and social development. Stemmed from fundamental pecuniary aspects, President Yameen’s policies will ensure the distribution of the benefits of economic growth to all Maldivians through a progressive model of development that migrates from the traditional Male' centric development model, to the delivery of a productive, healthy, happy life for every citizen, irrespective of their geographical location, guaranteeing inclusive national development for all. While strengthening state-owned companies in association with the private sector, additional streamlined state-owned entities; one focused on general infrastructure development, and another on real estate development, to bolster national capacity; will be established in order to deliver the President’s pledges at reduced costs. President Yameen’s PPM government will create three integrated urban development zones. • The Northern Development Zone (Haa Alifu and Haa Dhaalu Atolls with Project Ihaven as its centre). • The Southern Development Zone (Gaafu Alif, Gaafu Dhaalu, Gnaviyani and Addu city). These three zones will form the core development hubs of the future. President Yameen’s PPM government will develop all atoll capitals as livable cities that offer a high quality of life. This is the next layer of development, ensuring a city within a fifty mile radius from any island in the Maldives. President Yameen’s PPM Government will ensure the people living in every island of the Maldives enjoy the essential conveniences of modern living. A domestic Airport within a maximum travel time of 30 minutes. We will develop the Greater Male’ Region as the main hub of national development. The zone which consists of Male’, Hulhumale’, Vilimale’ and Villimale’ II, and Fushi Dhiggaru Falhu will be developed as the integrated pivot that drives the country’s economy. We will continue ongoing developments on Phase II of Hulhumale’. We will design and develop Villimale’ II to cater for a population of 315,000 in the islands of Thilafushi, Gulhifalhu and Villingili and ensure a home for every citizen over the age of 18 years, and to every citizen who is going to turn 18 till the year 2030. We will link the islands of Thilafushi, Gulhifalhu, Villingili by bridges to the capital Male’, thereby connecting the international seaport and logistics park to the international airport. We will transform Male’ as a highly appealing urban centre by relocating go-downs and dedicated government work sites around Male’ and by the repositioning of the Male’ Commercial Port to Thilafushi. We will develop the new Male’ International Seaport at Thilafushi with expanded facilities, with the capacity to manage future demand, including a logistics park and ample warehousing. We will develop high-end luxury housing and retail centres in Male’ boasting premium brands and entertainment centers. We will expand tourism in the region with an international theme park with tourist facilities, an international cruise terminal in Hulhumale’, and by developing Hulhumale’ Youth City as a surfing destination. We will build an International Convention Centre and an international multisport complex in Greater Male’. W We will build an International Airport in G.Dh. Kaadedhdhoo with a seaplane hub to provide connections from the airport to the resorts in the region, in the first two years. We will establish inter-atoll transportation system in Huvadhoo Atoll. We will build an additional International Airport in G.A. Vilingili. We will build a domestic airport in G.Dh. Faresmaathodaa. We will expand tourism in the zone with 10,000 tourism beds in Huvadhoo Atoll and additional beds in Addu city. We will establish a Southern Seaport with an international bunkering facility, in Addu city to act as the marine gateway to the zone and to facilitate trade generated by the tourism sector. We will establish a fish processing plant in Addu city. We will provide social and mid-range housing in all the major islands in the zone. We will build City Hotels and Retail Centres in Addu, Fuamulah and Thinadhoo. We will establish Addu city as a wellness tourism destination capitalizing on it's unique natural features. We will develop Hithadhoo Hospital as a Multispecialty Hospital. We will connect Hithadhoo and Meedhoo by land. 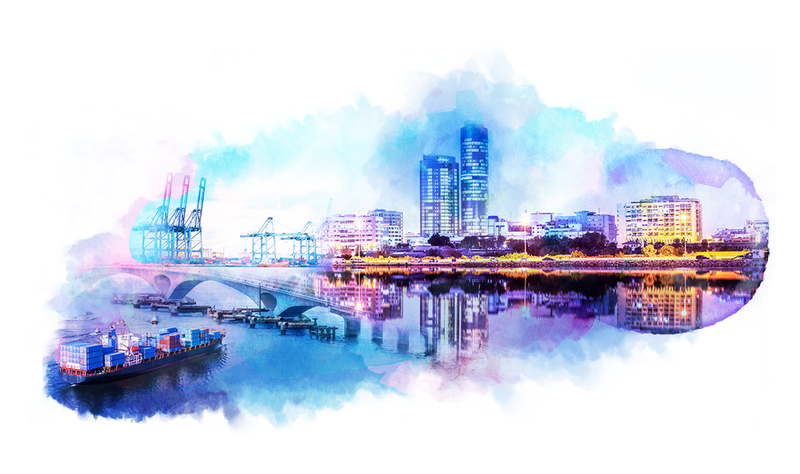 We will develop Ihaven as an integrated development project with an international airport, international transshipment port, connected with special economic zones. We will establish tourism in Ihaven with the development of thousands of tourist beds. We will develop an additional 3000 beds in Haa Alifu and Haa Dhaalu Atolls. We will develop Kulhudhufushi as the commercial hub of the region with a domestic airport, an international seaport, a logistics hub and an industrial zone for the establishment of new industries and businesses. We will build city Hotels in Kulhudhufushi. We will develop Kulhudhufushi Hospital as a Multispecialty Hospital. We will establish a domestic airport in H.A. Maafinolhu. to accomodate wide bodied aircrafts. We will develop townships in all atoll capitals and other major population centres, that will offer comfortable family living through the provision of affordable housing. Each township will have a preschool, shops, cafés and restaurants, self-service banking services, mosques, entertainment facilities, children’s parks and policing services among others. A township will offer the opportunity to develop community spirit and a sense of ownership and belonging to the community. We will build a minimum of 500 housing units in each of the atoll capitals of the country. We will build airports across the country to ensure that an airport is accessible from every inhabited island within 30 minutes by speedboat. President Yameen’s PPM government has exceeded public expectation by far on delivering clean water and sewerage services in the atolls. In 2013 there were 31 islands with sewerage systems. President Yameen’s PPM government has successfully completed sewerage systems in 26 islands, during the last 4 years. By the end of the year, installation of sewerage systems will be completed in 13 more islands. 27 more will be completed early next year and an additional 20 more have been contracted for construction. In 2013 there were only six islands in which clean water was connected. The PPM government has delivered clean water connections in 30 islands during the last five years and work on 15 more are currently underway. We will complete the installation of sewerage and water systems in all the inhabited islands. President Yameen’s PPM government has taken several bold steps; to alleviate the problems faced in the daily removal of refuse from households and islands as well as the safe disposal of non-biodegradable waste such as scrap metal, rubber, plastics and other carbon polymers; in terms of waste management in the Maldives' history. We will dispose waste deposits built up in islands over the past several decades and establish mechanisms to remove and transport waste from islands regularly. We will bring an end to the open burning of waste in Thilafushi with the integration of a proper waste management system that contributes to power generation in the Greater Male' Region. We will establish a refuse centre and provide vehicles for waste collection on all inhabited islands. We will ensure island environments including beaches are free from household and other waste through sustainable waste management protocols in all inhabited islands. We will create recycling centres in seven regions of the country and complete the establishment of the national waste management system. We will facilitate recycling of plastics, aluminum, paper and other such materials by the private sector through the establishment of a recycling fund. We will make a concentrated effort to mitigate ocean waste. President Yameen’s PPM government will strive to reduce household expenditure on electricity and promote environment friendly living. We will expand the green initiatives undertaken by the government such as 'POISED' and 'ASPIRE'. We will ensure that 50% of daytime energy requirement is generated from renewable sources such as solar power, wind and waste energy. We will conduct research on other sources such as tidal and wave energy. We will expand the ‘Magey Solar” program by providing financial and technical assistance to individual households to ensure that 30% of the energy requirement is sourced from renewable sources. We will reinstall electricity grids in the islands and modernize powerhouses to reduce greenhouse gas emissions and sound pollution. We will build mechanisms to protect the shorelines of every island experiencing serious problems of erosion and supplement such beaches with sand refills. We will establish a national environment protection fund of MVR 5 million for beach and island protection. We will establish a well-protected designated waterfront recreational and swimming area on every inhabited island, for use by island residents and visitors. We will provide modern bus services between Male’ and Hulhumale’, and bus services in Addu city, Fuamulah, G.Dh. Thinadhoo, L. Gan and L. Fonadhoo, H.Dh. Kulhudhufushi and other population centres. We will develop a comprehensive transport network with marine transport links and bus services to complement the regional airports infrastructure. We will introduce vessels with renewable energy. We will also allocate a fund for the private sector to utilize in the changeover to renewable energy. We will create bicycle lanes on all islands, where possible. We will also remove the import duties on bicycles and establish mechanisms for people to attain and use bicycles conveniently through the island councils.